I’ve been really exited to include knits in the collection I made; a main reason has been that not only is it a craft that I really enjoy doing, but it is also something I strongly associate with my grandparents and their generation (both in learning handcrafts from them, but also having and appreciating handmade objects that they created). 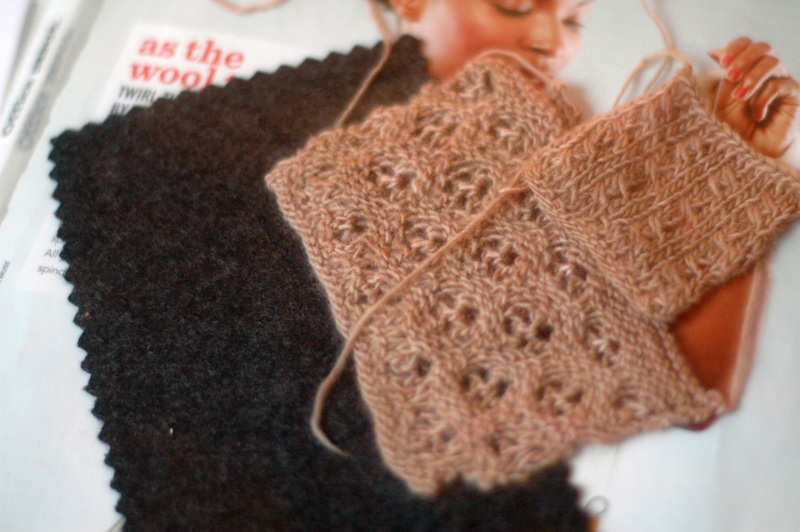 The knit swatches for the “Geithus” lace top. Another reason lies in the fantastic possibilities in creating your own fabric, where the choice of color and texture is almost endless. I so enjoyed being able to custom design something that felt very right for the collection, and then to be able to choose from a world of wools in all sorts of thicknesses and qualities and hues to make a fabric. 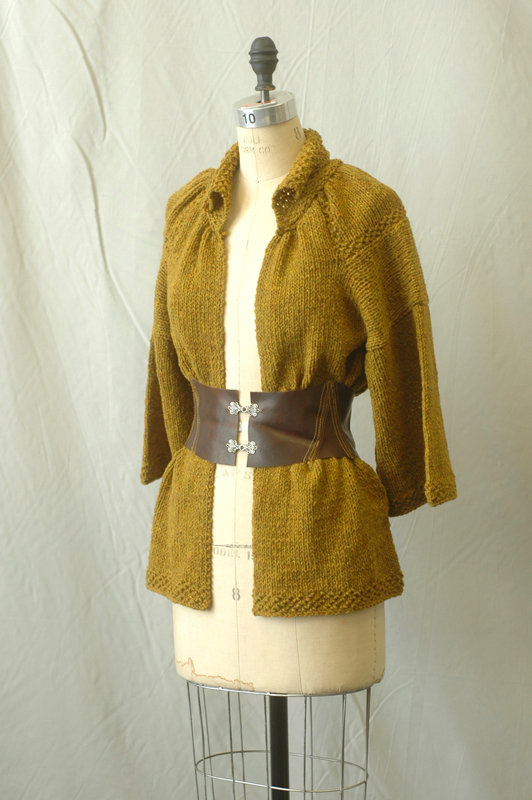 Like I’ve mentioned before, the knit jacket is based on the traditional embroidered linen shirt that goes with my particular style of folk costume. As I was analyzing the shirt, I realized is was mostly made up of rectangles; the collar, the sleeves, the body, and the godets are almost all perfect rectangles. This makes perfect sense in considering the background of these folk costumes – which is medieval every-day work clothes. At a time when cloth was made by each family on a loom, the available fabric was rectangular to begin with. In an effort to make full use of the cloth they had spent a significant amount of time making, most ancient clothes and regional folk wear around the world, is based on geometric shapes. Though I made the first samples of this in a cotton jersey, I did make a paper pattern to help me write out the knitting pattern. And with a zero-waste pattern-making workshop fresh in my head, I drew up the pattern shapes in Illustrator. It’s easy to see the geometric shapes that way, and – if I want to challenge myself – a good starting point to make this pattern true no-waste; no fabric scraps cut away or wasted! If I could make all these rectangles go edge to edge, and not require cutting away any fabric, it would be zero-waste! Since I made it as a hand-knit piece, I was able to knit only the shapes I needed, but it could be a nice challenge to myself to turn this into a zero-waste pattern for non-handknit fabrics. 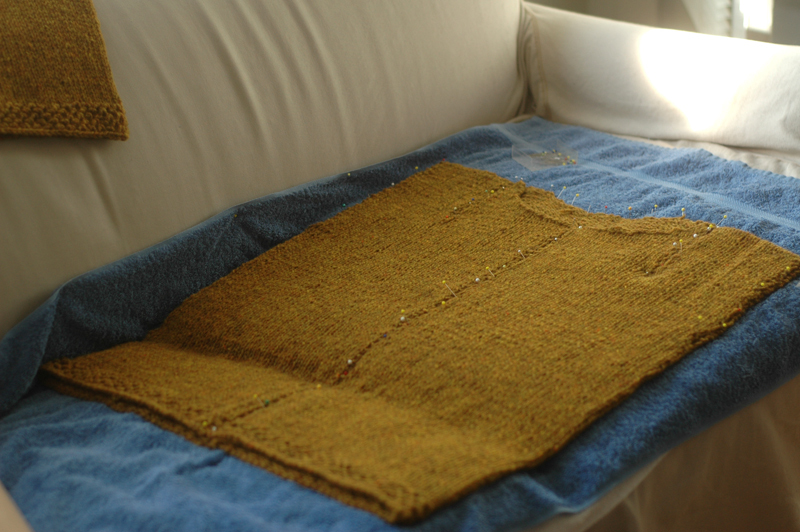 Blocking the knit pieces into the right dimensions. In this view it’s a little easier to see that the pieces are mostly all rectangles, and also to see how the godet, or insert, at the shoulder functions. 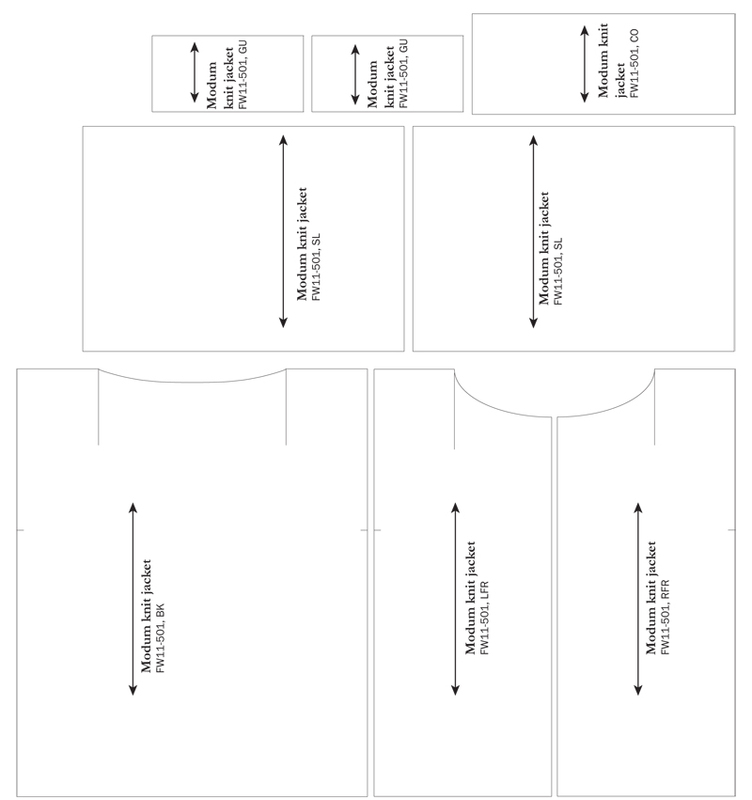 It is a rectangle that fits into a slit on the front and the back bodice, and is gathered at the neckline. In the original folk costume shirt I think it allows for more movement, and in my jacket it was also a place to use the honey-comb pattern. 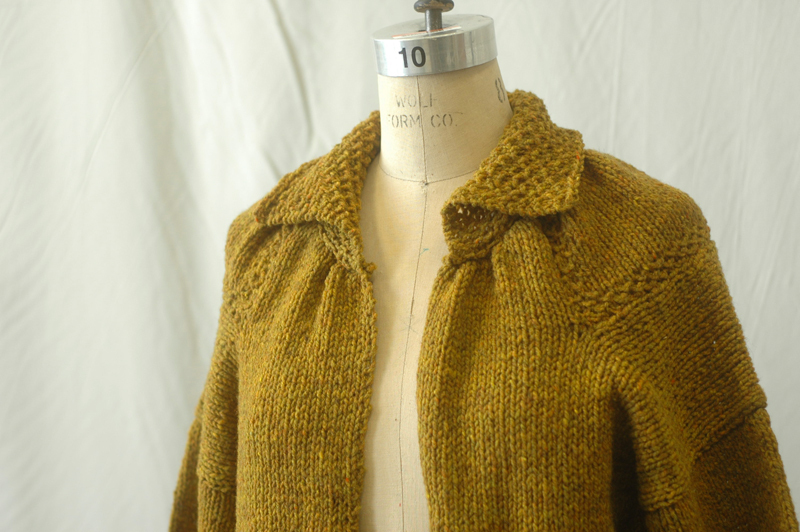 On both the jacket and the lace top I used stitch patterns reminiscent of honey-comb. My grandfather was a beekeeper, and I wanted to bring him and my memories of him into my work somehow. I picked these two stitches from stitch libraries to be evocative of the geometric and layered texture of honeycomb, and I’m really pleased with how it turned out! This lace top was a real test of my patience and skills and mind-power. 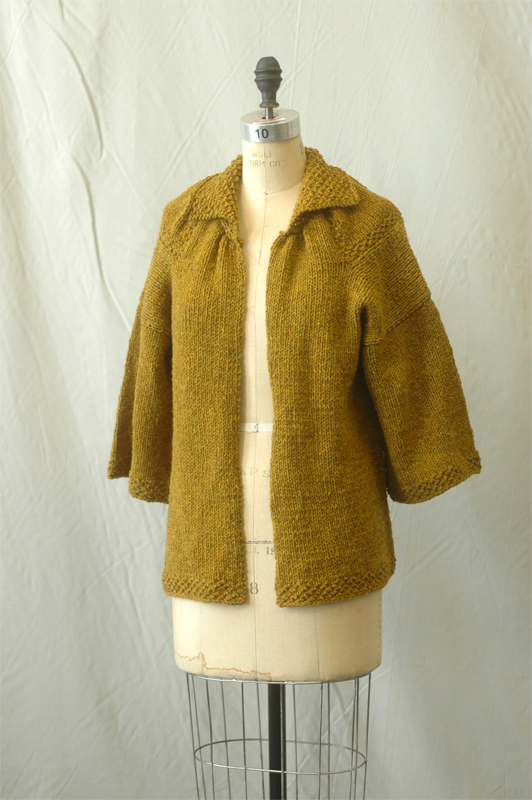 I spent a month and 4 days on this from start to finish (according to ravelry), which included the commute on the train every day, between classes, in classes… any free moment I had! 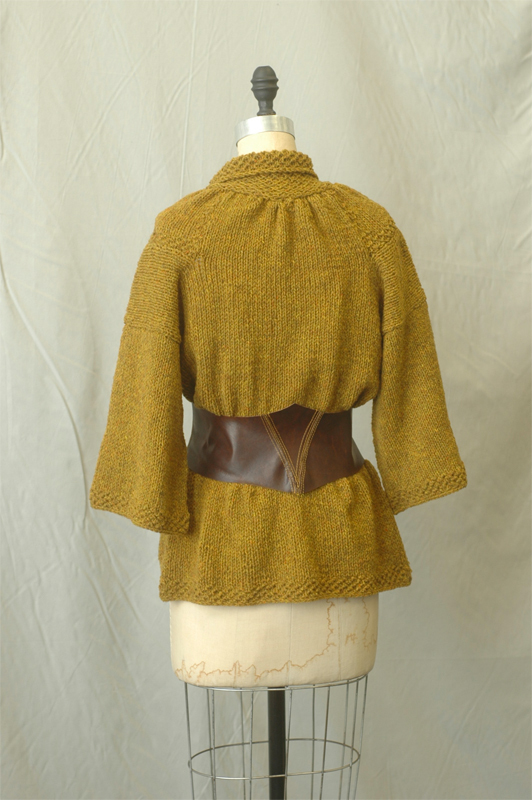 I even sat up till the wee hours of the morning before our photoshoot, because unlike a pair of pants that can be folded up to look hemmed, there really is no way of faking a finished knitted garment! 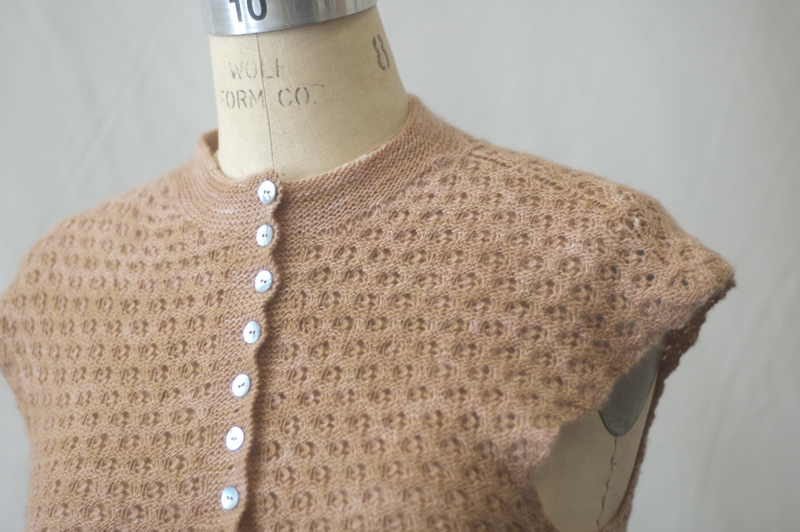 The bottom half of the top is knit in the round, and then flat, or back and forth, from the bottom of the button stand. 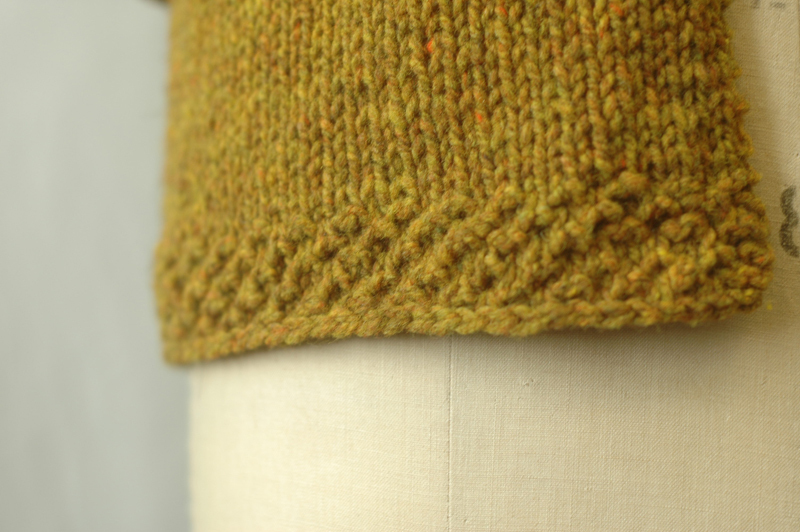 I discovered that I had to knit slightly differently flat than in the round, which might not be the most comforting thing to realize in the middle of a garment, but I didn’t have time to worry about that! I also used a little over 2 skeins, but with my Malabrigo yarn being hand-dyed, the colors didn’t match entirely. I solved that by alternating rows when I started a new skein, to make the transition a little less noticeably. 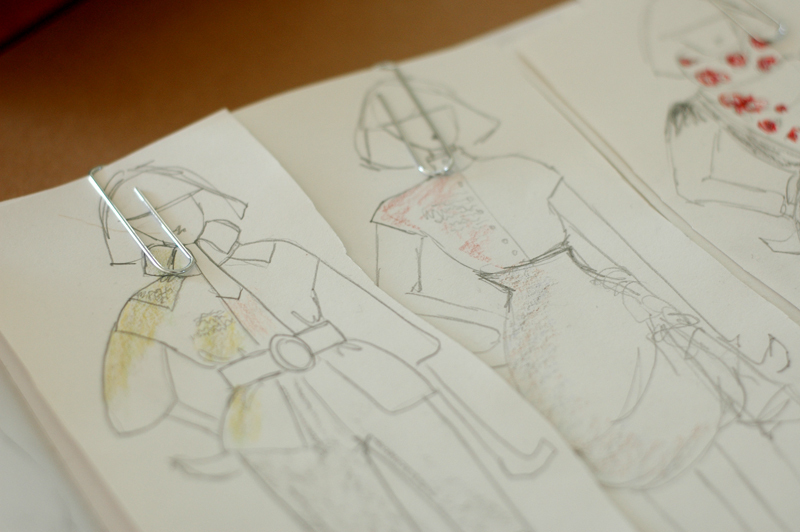 Similarly to the knit jacket, I draped a jersey muslin on the dress form first, transferred that to paper, and then measured the paper pattern to come up with the written pattern. It was a whole lot of crunching numbers and gauge and row counts and numbers of stitches! 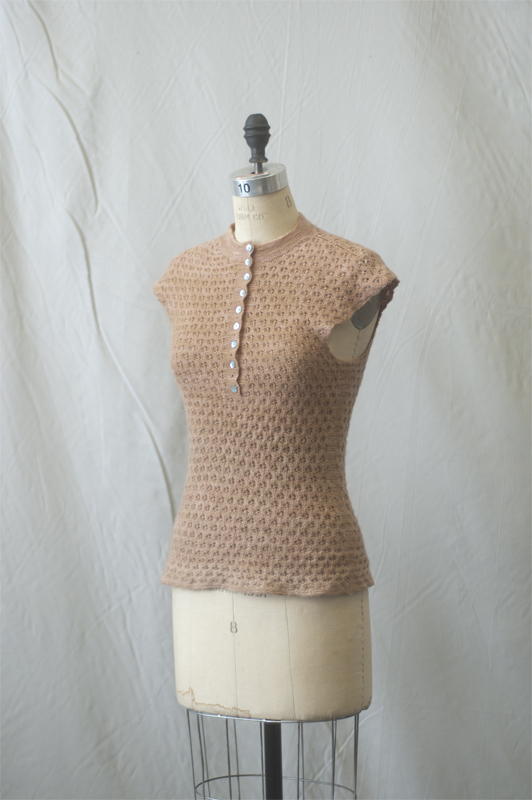 It was also very satisfying and a lot of fun to be able to develop a real pattern for a knit garment, and my next step is to clean up the pattern so I can publish it – hopefully in the fall! Thank you Whitney! And that’s great to know that there are people like you who are interested in it! This is such a beautiful top. I bit beyond my knitting skills at the moment by the look of it. But so dreamy and romantic. Thank you jadestar! I have to say, it felt like it would be quite a stretch for me – never having done anything more complicated than a fairly simple, small lace scarf, but…. somehow I did it! 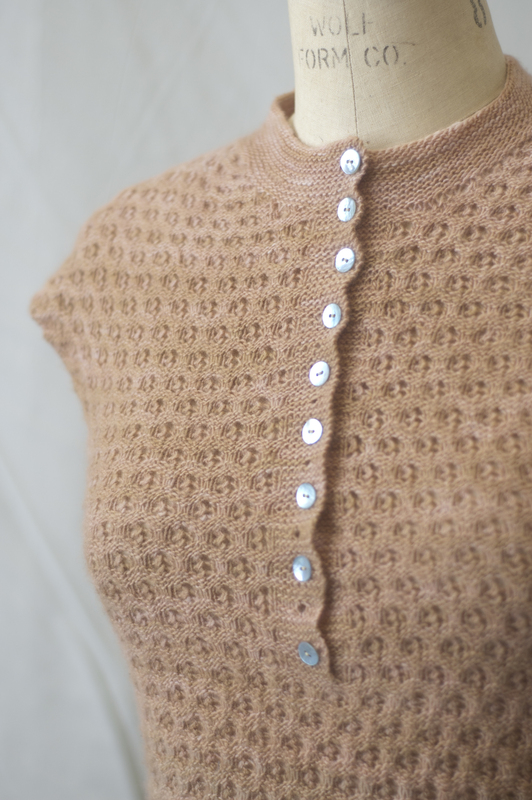 The stitch pattern is a combination of knit, purl, yo’s and k2tog – maybe someday soon you’ll feel up for it! ;) Good luck on your sewing and knitting adventures! Did I remember to mention how much I LOVE your style?